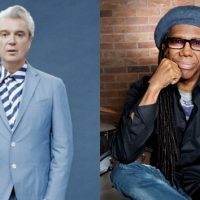 Jody Rogac; Jill FurmanovskyA pair of Rock & Roll Hall of Fame inductees — ex-Talking Heads frontman David Byrne and Chic‘s Nile Rodgers — have joined the lineup of featured speakers at the 2019 South by Southwest Festival, which runs from March 8 to March 17 in Austin, Texas. Byrne’s speech, which is scheduled for March 13 at 12:30 p.m. CT, will be a presentation of his ongoing Reasons to Be Cheerful series. The multimedia event focuses on positive current music, writings, news stories, concepts and other happenings in the world, with a goal of encouraging people to act locally for the good of their communities. As previously reported, David Crosby and ABBA‘s Bjorn Ulvaeus also will be featured speakers at the South by Southwest Festival. Crosby, along with filmmaker and rock journalist Cameron Crowe, will be on hand to chat about the new documentary David Crosby: Remember My Name on March 13 at 2 p.m. CT.
Ulvaeus will appear on March 14 at 3:30 p.m. CT to discuss Auddly, a company he co-founded that helps songwriters gain control over the rights to their compositions. Visit SXSW.com for full details about the festival.